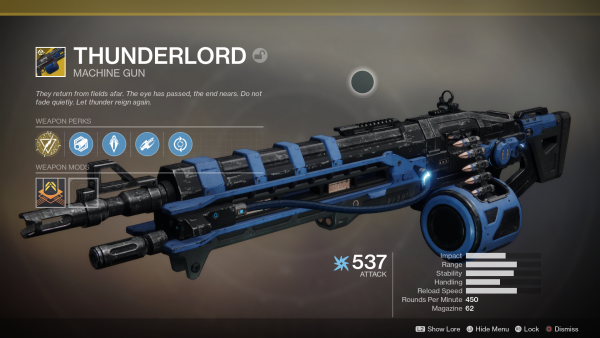 Destiny 2 players who enjoyed using the Thunderlord Exotic machine gun in Destiny 1 will be pleased to know it has made a return. Rumours of the gun coming back to the game surfaced earlier this month, and of course, proved to be true. Destiny 2 players who completed the final phase of The Lost Cryptarch murder mystery questline will receive the weapons as a reward. You’ll have until next week to complete the quest and claim your prize. The quest kicked off during the Festival of the Lost event with the quest Journal of the Reef Cryptarch. In order to claim their prize, players will need to go to the Cosmodrome in Old Russia and fight waves of enemies and the Fallen boss. How do you get it? Beat all of the aforementioned baddies, earn the Exotic Engram from the murdered Master Ives, and decrypt it into Thunderlord. Pretty simple. As Arekkz notes in his video, perks for the machine gun is stronger this time out and lightning still plays a part. The intrinsic perk Rein Havoc will generate lightning strikes from above. Its trait, Lightning Rounds, sees the weapon fire faster and more accurately the longer the trigger is held down with continuous damage generating lighting strikes. Kills with the weapon also increase reload time for a short while. Take our word for it when we say that this beast packs a bunch in PvP. When Black Armory arrives in December, more machine guns will become available which is going to make PvPVe matches much more interesting. Looking for more Exotic weapons, ways to boost your Power or where to find more Seeds of Light? Then head over to our ultimate Destiny 2: Forsaken page.